Yvonne Carmichael sits in the witness box. Her charge is murder. Before all this, she was happily married, a successful scientist, a mother of two. Now she is a suspect squirming beneath fluorescent lights and the blank yet penetrating gaze of her lover — and alleged accomplice. As she speaks to the prosecution, she must piece together the story of her affair with this unnamed figure who has charmed and haunted her. And there he is, staring, wearing the same suit he wore on their first meeting, when he put his hand on her elbow and guided her to a deserted chapel, where she began to undress. Yvonne’s is a tale of sexual intrigue and the ruthlessness of our urges. Driven by a heedless passion, she enters a life of treachery and infidelity. In her rapture, she tells herself stories that will explain her lover’s secrecy — he is a dark and appealing silhouette behind the veil of her trembling desire. But Yvonne has failed to notice the danger about to blindside her from a seemingly innocuous angle, and this act of violence reveals that her ability to exact justice and revenge has been compromised. Everything hinges on one night in a dark little alley called Apple Tree Yard. How high can passion mount before it becomes madness? In her life of complacency and privilege, has Yvonne been denying the truth about herself? And can this trial reveal something dark and unforgivable behind her placid front? 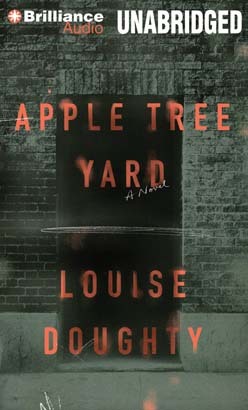 Suspenseful, erotically charged, and masterfully paced, Louise Doughty’s Apple Tree Yard is a psychological thriller that calls to mind Gillian Flynn’s Gone Girl even as it stakes out its own chilling territory. This is a story about desire and its consequences by a writer of phenomenal gifts. Skilfully crafted story - brilliantly narrated - thoroughly enjoyable! This is one of those great books that helps you realize how blind people can be when they fall in love with a person or idea of a person. No matter how intelligent, wealthy, lucky or otherwise, people are blind when it comes to love. The book kept my attention to the very end and I hated it when it ended. I highly recommend.